Vanda's embroidery stitching style is completely unique and she approaches each piece as a piece of art as much as needlecraft . An original embroidery will take weeks to complete and a piece similar to the "Cornflowers in the Castle", shown above, will cost from £2,400. We have reproduced some of Vanda's work as beautifully crafted fine art prints, which have to be seen to be believed. Those which have been reproduced as either open or limited edition prints are noted in the photo gallery. See link below. An embroidery begins as a painting would, with a moment of inspiration, something beautiful seen that you want to capture forever. It's a medium that lends itself perfectly to the intricacies and colour of the natural world. The basic design is drawn on paper, using photographic images to help compose the picture, and the main lines are stitched onto a piece of Belfast linen using the paper drawing as a template. Then the stitching begins using anything from one to 5 or 6 strands of embroidery cotton, to create perspective in the work. By varying the thickness of the cotton and the intensity of the colour a highly "3D" effect can be achieved - "it feels as if you could walk into the scene". An embroidery can be compared to a handwoven carpet - each one may take weeks to complete and the result is a highly intricate and original piece of art. 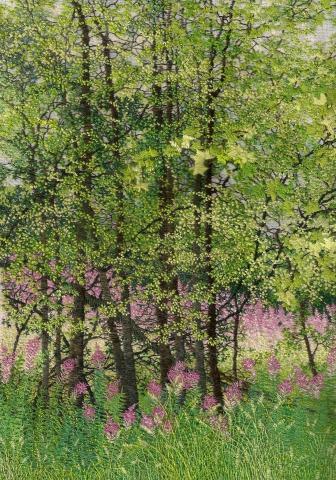 Embroidery is a wonderful medium in which to create a memory of a beautiful garden or landscape. An embroidery can be created from a single clear colour photograph and makes a beautiful and very personal gift to be treasured and handed down in the family. Click Embroidery Gallery to see more of Vanda's work.